I honestly can’t tell you what’s going on in this video from NASCAR’s Facebook page, other than it recaps the first three Chase for the Championship races and that the drivers look like a bunch of Power Rangers running around. What I can say is that it is truly, honestly, the most entertaining thing I’ve seen all day. 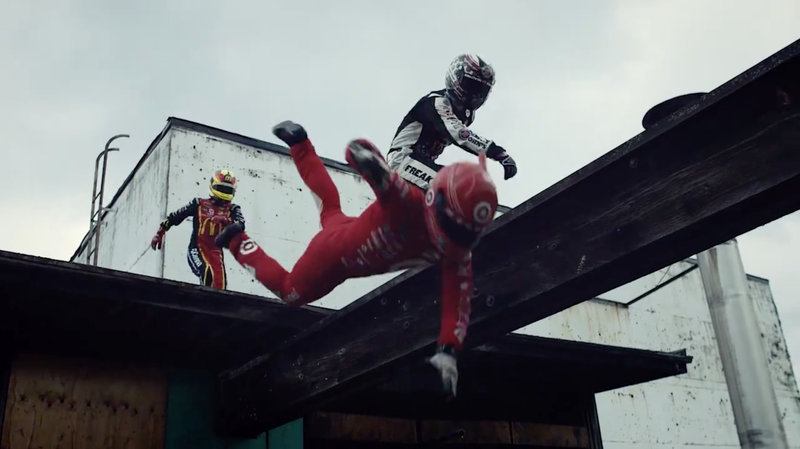 Why does Kevin Harvick violently push Kyle Larson off of a rail? Why is poor Jamie McMurray hanging from the side of a building? Why is an unsuspecting street cyclist in the way when Chris Buescher decides to his best impression of a football tackle? I don’t know! I mean, it’s a metaphor for what happened during the races, but who thought of this weirdness? I wish I had, honestly. Simple race highlights probably would have been cheaper and easier to produce, but this was definitely the more fun route—especially because there were only six cars left on the lead lap at the end of the Dover International Speedway race. Yes, really. I now know that I like this “NASCAR racing on foot” thing in the real world just as much as I do in the movies. Let’s go Ricky Bobby on the final race, eh?